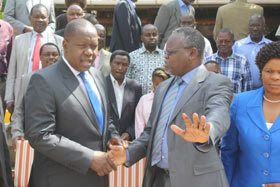 Cabinet Secretary (CS) Ministry of Education Science and Technology Dr. Fred Matiang’i has urged universities to invest heavily in Research, Science, Engineering and Technology saying that they will play a key role in development of the country and contribute to the realisation of Vision 2030. Speaking at academic conference organized by the Technical University of Kenya in Nakuru over the weekend, Dr. Matiang’i raised concerned that only 22% of students in universities, enrol for Science, Technology, Mathematics and Engineering courses. 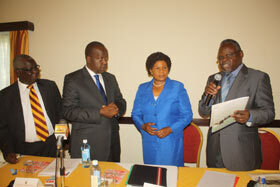 Dr. Matiang’i receiving a folder from Vice-Chancellor Prof. Francis Aduol. Dr. Fred Matiang'i Addresses participants. With him is university Council Chairman Prof. Godfrey Nguru. The CS noted that poorly trained graduates were released to the labour market and therefore hindered growth and development of an economy. He underscored the Ministry‘s commitment in ensuring that high academic standards are upheld during appointments. Dr. Matiang’i decried ethninicity, nepotism and favouritism as some of the factors practiced by some learning institutions when it comes to employment. He reminded universities to rise above that, instead provide leadership and stick to professionalism when recruiting staff. He praised TU-K for organizing an event he described as unique and innovative. “You have demonstrated what we want from academic institution. On behalf of the ministry, I wish to thank you sincerely for the role you are playing in shaping academic standards in the Country,” he said. Dr. Matiang’i noted that TU-K occupies a unique position as a premier institution offering technical education and therefore urged the university to be faithful to it’s mandate and stay on the same course. Principal Secretary, State Department of University Education Prof. Colete Suda urged universities to work closely with other stakeholders in mobilising resources and focus on producing quality graduates as well as researchers. Various personalities addressed the more than 35 professors who attended the conference among them, Laikipia University Chancellor Prof. Raphael Munavu, TU-K Council Chairman Prof. Godfrey Nguru, Vice-Chancellor Prof. Francis Aduol, Maseno University Vice-chancellor Prof. Dominic Makawiti and internationally acclaimed academics.